OCS Checkweighers is a leading global provider and manufacturer of dynamic weighing technology and product control. OCS Checkweighers is your innovative, reliable partner for high performance, process and customer orientated weighing and inspection solutions. WIPOTEC-OCS stands for outstanding manufacturing quality "Made in Germany", the highest ease of integration and profound sector expertise. EquipNet is constantly receiving used OCS Checkweigher equipment through our exclusive contracts with our clients. 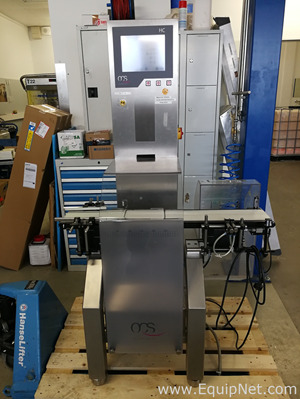 Our inventory of used OCS checkeweigher equipment includes an OCS Checkweigher HC Check Weigher, OCS Checkweigher Model HC2000 and an OCS HC Digital High Speed Checkweigher With Wipotec EC 2000 Load Cell. If you do not see the used OCS checkweighing equipment you are looking for, call one of our representatives and we will find it for you. We can also source the right tooling and change parts that you need through our huge network of corporate clients from around the globe.